- for boke yoke see below ! Address: 2-1-11 Tenjin-cho. Suma-ku. 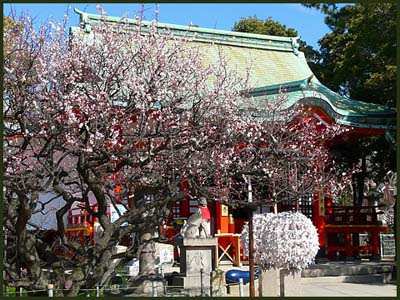 Kobe City Hyogo Japan Telephone: 078-734-0640.
. Tenman-Gu Shrines in Japan 天満宮. 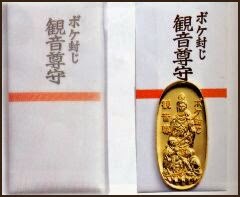 is described in the old book "Nihon ni-ju-gosha no hitotsu" (one of the 25 shrines of Japan) under the name 'Settsu no Kuni Tsunashiki Tenjin' and has Sugawara Michizane as its principal deity. Michizane was a Heian period(794-1192) court official who was sent to Kyushu for demotion. On the way his vessel met with a storm. In order to escape the wind and rain, he landed in Suma and stayed for night. The fisherman of the village wound a large round mat from a thick fishing net rope and placed it under a pine tree for him to rest upon. 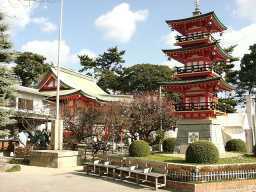 In 979, out of remembrance and respect for Michizane, the people of the village constructed the shrine. Michizane is thought of as a deity of study, so many students can be seen praying here, especially on the shrine's festival day; January 25th . 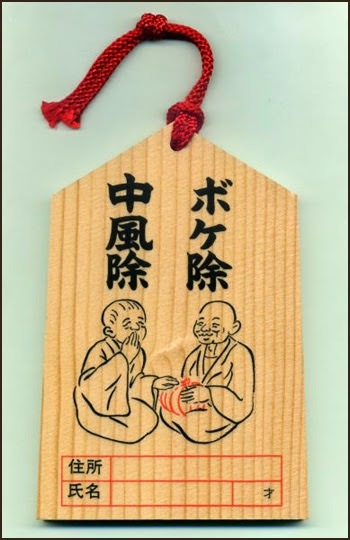 Michizane wrote many poems about ume (Japanese apricot) and so many people also come to pray here during ume blossom season.
. Me da deru ... to have good luck - Daruma . Click on the image for more !
. Magatama 勾玉腕守り Magatama jewels, curved beads . 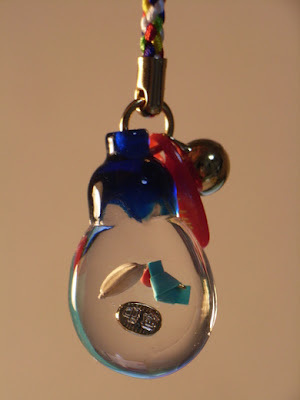 nasu mamori なす守り "eggplant amulet"
. sasuri Jizoo san さすり地蔵さん Jizo to rub the head . 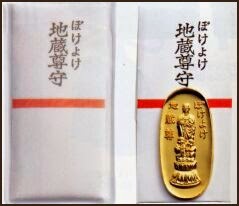 Mikawa - Aichi Fudo Pilgrims .
. Eggplant Amulets 茄子守り札 .